Laurent Marie Bernard DOGNIN, bishop of Quimper and Léon since 20 May 2015. Laurent DOGNIN, a member of the Priestly Fraternity was born in Paris on 3 January 1953. He has five brothers and sisters and grew up in Meudon where he was aware of his calling from the age of eight. He was ordained priest 15 June 1980 for the diocese of Nanterre. He served successively as assistant priest in Levallois-Perret until 1986, as Assistant Priest and then Parish Priest of the Parish of Sainte-Geneviève at Asnières-sur-Seine until 1997. From 1988 to 1990 he was also regional delegate of the Frat de Lourdes, youth pilgrimage. In 1997 he became Parish Priest of Saint-Pierre et Saint-Jacques and Dean of Neuilly-sur-Seine, a post he held until 2006. From 2003 to 2006 he was also episcopal Vicar for for the Centre region of the diocese of Nanterre. 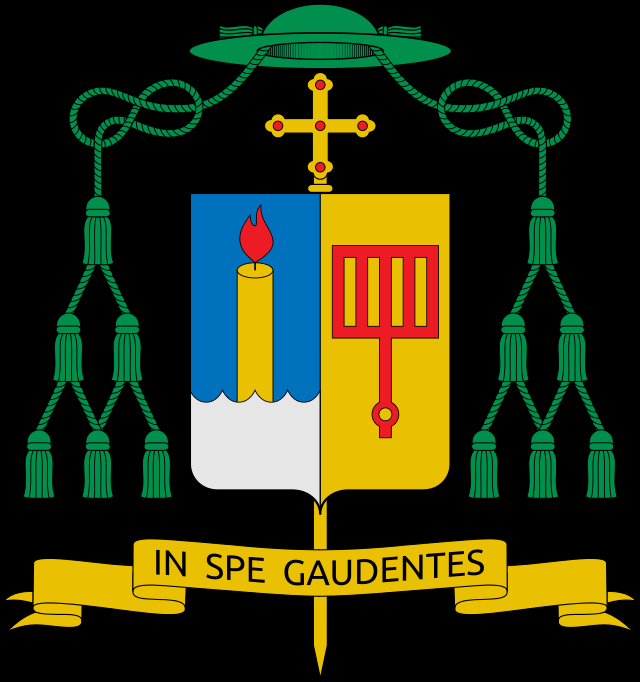 In 2006, he became Vicar General of the diocese with special care for consecrated life, and care for movements and associations of the faithful and moderator of the diocesan Curia. He also took on responsibilities within the Priestly Fraternity Jesus Caritas where he was regional responsible for the Ile-de-France and Upper Normandy from 2002 to 2008 and European Responsible from 2007 to 2011. Inspired by the spirituality of Charles de FOUCAULD, he had formed the habit before his nomination as Bishop, of practising once a month a desert day. On 5 January 2011, Pope Benedict XVI nominated him titular bishop of Macriana di Mauretania and auxiliary bishop of Bordeaux to Cardinal Jean-Pierre Ricard. He was consecrated by the latter on 27th February 2011. On 20 May 2015 he was nominated by Pope Francis as Bishop of Quimper and Léon (Brittany) and he will be installed on 5 July in the Cathedral of Saint-Corentin de Quimper. Not knowing the diocese which he traversed on motorcycle in his youth, at his nomination he expressed the wish to learn some words of Breton but also to get to understand the culture. From 2012 to 2014, he has been a member of the Episcopal Commission for universal Mission of the Church. Head of the National Department for the pastoral care of Migrants and Itinerant people (SNPMPI). In this capacity, he participated, along with eighteen Christian organizations, in the preparation of a brochure dedicated to a Christian reflection on the reception of migrants: “Towards encountering a brother come from outside”. On 17 April 2013, he was elected president of the Board of Direction of RCF (Radios Chrétiennes Francophones), at the plenary meeting of the bishops of France in Paris. At the plenary meeting of the \bishops of France in April 2014, moreover, he was elected as President of the Episcopal Commission for the universal Mission of the Church a role he assumed on 1st July 2014.